Research has shown that around 25 million people in the UK use the social media platform LinkedIn for recruitment, job hunting, showing off their career skills and company ethos. As a base to showcase your expertise as an employee with experience, there are all kinds of weird and wonderful roles and job titles that appear out of the norm. Ninjas, Wizards, Magicians, and Gurus have been found on LinkedIn with obscure and puzzling full titles to name but a few, but it’s what describes us best that matters. According to current user information, there are 14,536 men that have the title ‘Stay at Home Dad’ and only 9,474 women who publish themselves as a ‘Stay at Home Mum’. Additionally, 23,956 users of LinkedIn are titled ‘Stay at Home Parent’. We don’t need to rely on job descriptions to know what these users do in their day to day, but to see what they could be potentially earning as a stay-at-home parent was something that proved interesting. Funky Pigeon has done the research into what a parent could be earning if paid for everything that they do; cooking, cleaning, nursing, teaching, taxi-driving, organizing, laundry, mentoring. 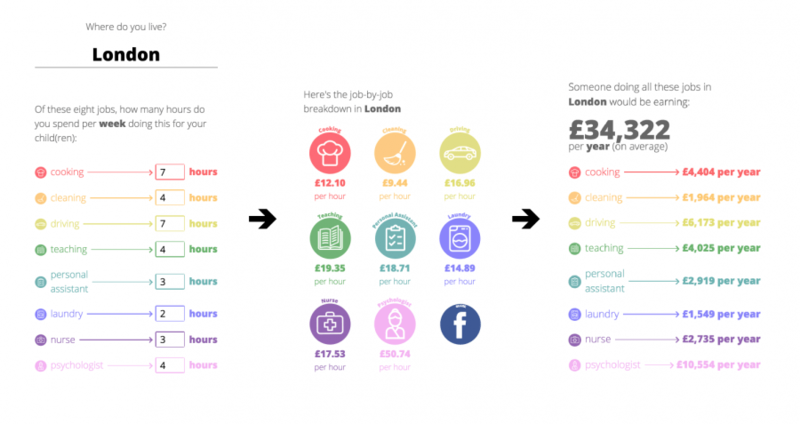 If paid for each of these eight jobs, in London a parent could earn an average of £263,587 a year. Are parents returning to work and how can we recruit them, or are they now off limits and full-time parents? Looking at recently published data from ONS, the employment rate for mothers was 74.0% in the second quarter of 2018 (April – June), which has increased rapidly from 68.9% in 2013 and from 61.9% in 1996. Further ONS analysis shows that since 2010, the employment rate for mothers has remained higher than the employment rate for women without children, whereas the employment rate for fathers has consistently been higher than for men without children – are we in a financial state where parents must work to afford to live, or is this a life choice? It’s reported that five in 10 mothers work 30 or more hours in their usual working week, compared with almost seven in 10 (69.7%) women without dependent children who work these hours. In the months of April to June 2018, almost three-quarters (72.5%) of families with couple parents had both parents in employment; of these families, almost half (45.5%) had both parents in full-time employment. There are many questionable considerations among parenting sites in recent times where the affordability of working versus childcare is weighed up; the cost of childcare being almost similar to a parent going back into the world of work. With the costs of childcare being an important factor as well as the rising cost of living, many parents don’t return to work and become a stay-at-home parent whether full time or temporarily. Though with the gender pay gap being an issue on the way to being resolved and the cost of living rising, what are the potential earnings of being a SAHP (stay-at-home-parent), and can you earn more in full employment? The new tool from Funky Pigeon allows you to calculate your potential parent salary by inputting the hours that are spent on parental jobs at home weekly, where you can see by town, city, and region where the best salaries for each job may be. With the results varying by location in the UK, it’s interesting to see a parent’s potential earnings should they be billed for each ‘job’ that they do. About the author: Simon Osborne is Content Manager at Funky Pigeon. He is the online content creator and search manager at Funky Pigeon, trying to focus on making genuinely useful blog articles and engaging tools in a world too full of information.